If you’re like me, you will constantly ask yourself the same question every week: “What should I make for Shabbat this week?” I like changing things up from week to week but that’s not always easy to do since I get home only moments before dinnertime each Friday. When I know that it’s going to be a bit too late to make a nice Shabbat dinner, I make this go-to chicken and rice dish. It looks gorgeous, tastes incredible, comes together in no time, and you can make it all in one pan that goes straight into the oven. Could you really ask for more? Well, there is more…you can assemble this a day ahead of time and throw it in the oven when you get home. Yes, it is a Shabbat dream come true. Sumac, that beautiful reddish-purple, tangy spice has more uses than you can imagine. I seem to use it in every recipe that I use lemon in like salad dressings, over fish, on avocado toast, and on chicken. 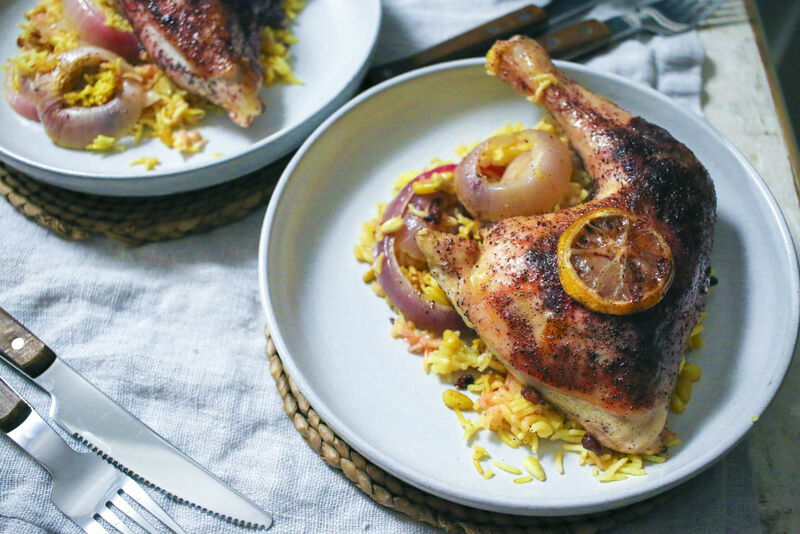 It not only gives this chicken a gorgeous hue, but rubbing the spice mix under the skin of the chicken ensures that the flavor penetrates into the meat. Don’t skip that step! The rice that the chicken sits on top isn’t your basic white rice either. It’s tossed with turmeric, pine nuts and berberis (or barberries). These little dried berries are tangy and bring a beautiful pop of color to the rice. If you cannot find them, you can substitute them out for cranberries. This method of cooking the chicken on top of the rice is insanely good. All of the good chicken juices drip onto the rice that just soaks them all up. 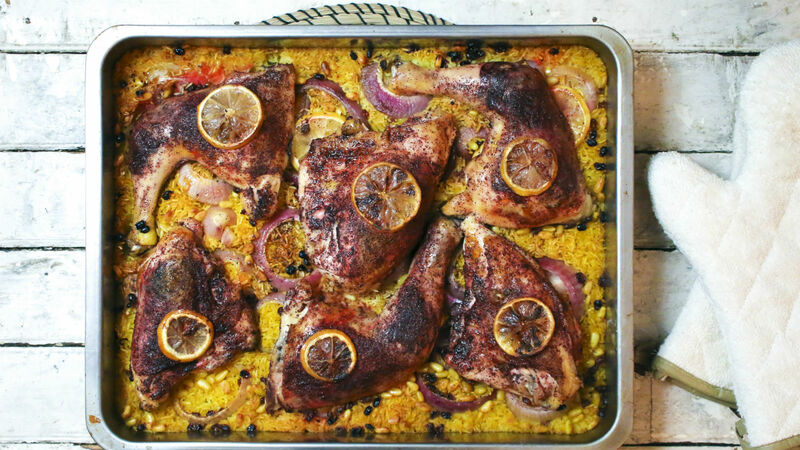 Make this for any holiday–it’s not just for Shabbat dinner! It can feed a crowd if you double the recipe too with no additional effort. Pre-heat the oven to 400˚F with the rack in the middle. Make the spice rub by combining the sumac, lemon zest, salt and white pepper in a small bowl. Rub the spice mix under the skin and on top of the pieces of chicken. In a roasting pan, combine the rice, pine nuts, berberis, turmeric, salt and 2 tablespoons of olive oil until the rice is a beautiful yellow color. Press the rice down so it’s pretty flat. Top the rice with the slices of red onion and lay the chicken pieces on top of the onions. Top each piece of chicken with a lemon slice. If you are assembling ahead of time and roasting later, this is the point you will want to cover the roasting pan with tin foil or lid and set in the fridge. Pour the stock around the chicken onto the rice. Drizzle the chicken with a decent amount of olive oil. Cover the roasting pan tightly with tin foil and place it in the oven. Roast for 40 minutes. Remove the foil and continue roasting for an additional 20-25 minutes until the chicken is cooked through and the rice has soaked up all of the liquids. Easy enough for a weeknight dinner, but delicious enough for Shabbat. This American comfort food classic gets an Israeli twist with plenty of za'atar and fresh thyme.